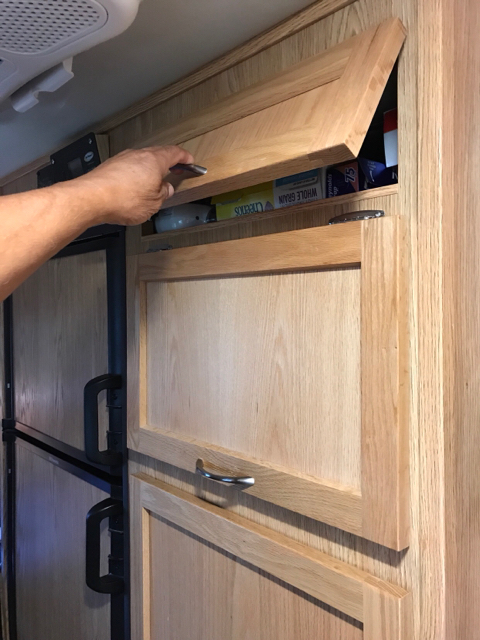 For the life of me, I cannot find the thread that discussed a spring loaded hinge to keep the small door above the microwave cabinet open. Can anyone help? I think this is the thread you are looking for. Yes, you need those hinges!!! It's so nice having that door stay open on its own. I'm still bummed ETI took that cabinet away. Those viewing my trailer really like it as well and were bummed to hear it wasn't available any longer. Dirk said they were kind of a pain to install, but well worth it. Hi Laura! I found the hinges at Home Depot and Lowe's. Can you post a screenshot of them already installed? Thanks to Ralph and Paulette for their assistance! Can anyone who has this modification please let us know the internal height of the two upper cabinets please? Thanks much. Hi Chris & Patricia, I will be happy to measure for you. 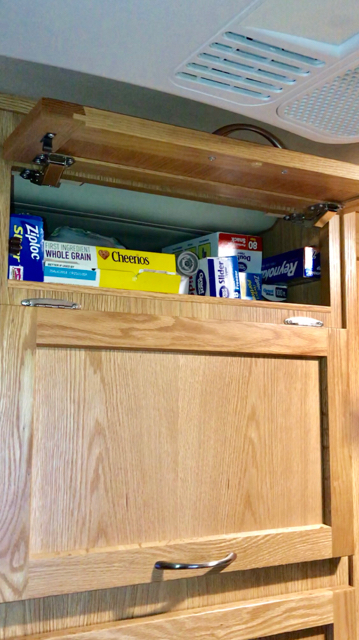 On ours, the lower cabinet is about 12” high on the inside. The small upper cabinet is about 8”-8.5” in the front, but it slopes downward to about 6” - 6.5”, due to the roof contour. I did not realize ETI was installing the small cabinet above the microwave door again.